Three Silent Hill games are coming out next year. Each just a month apart. As a Silent Hill fan, all I can do is become excited about 2012. The first of the three releases is the Silent Hill HD Collection. Developed by Hijinx Studios, the Silent Hill HD Collection brings Silent Hill 2 and 3 into the high definition era on both the Xbox 360 and Playstation 3. While at Konami, Whitney and I did not only play Silent Hill: Downpour, the latest entry in the series, but also Silent Hill 2 and 3 HD, respectively. I played through Silent Hill 3; Whitney played Silent Hill 2. We had decided who would play which prior to getting to the studio. Booting up the Collection took us to a main menu screen with art of Pyramid Head and the Missionary from Silent Hill 3. From there, the option to start either game was given. Clicking either brings you to the game’s menu which remains unchanged from its past counterpart. 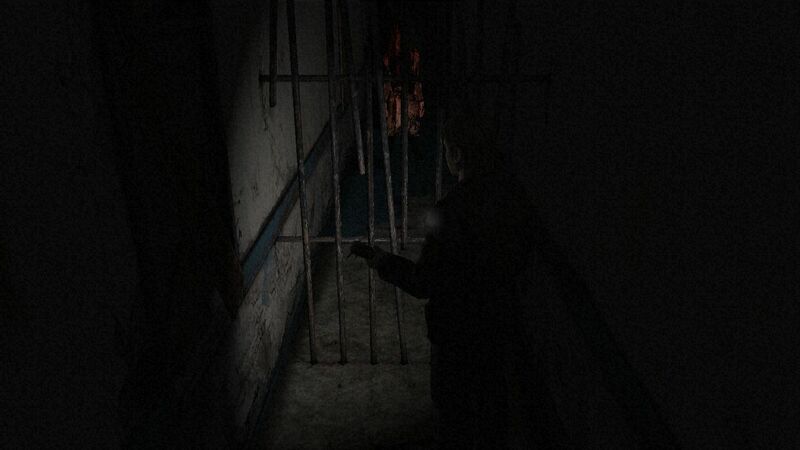 Looking at Silent Hill 3 in HD, the change in lighting and textures is immediately noticeable. 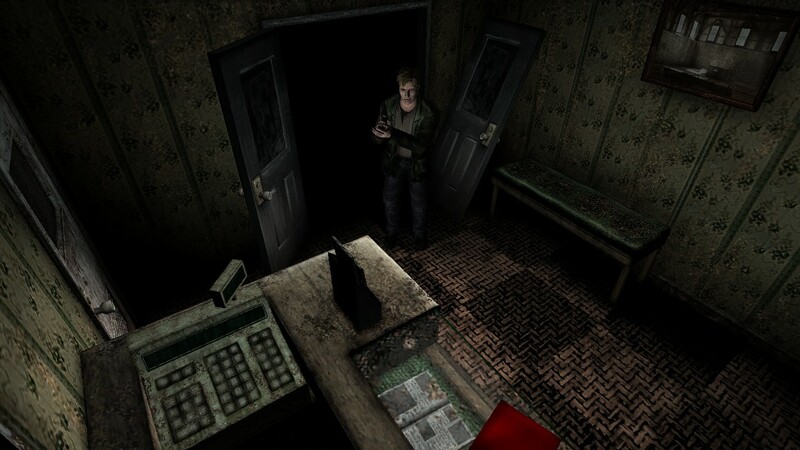 Silent Hill 3 is on PC, so it technically can be played in HD with anti-aliasing and other resolution enhancements, but the textures did not improve. 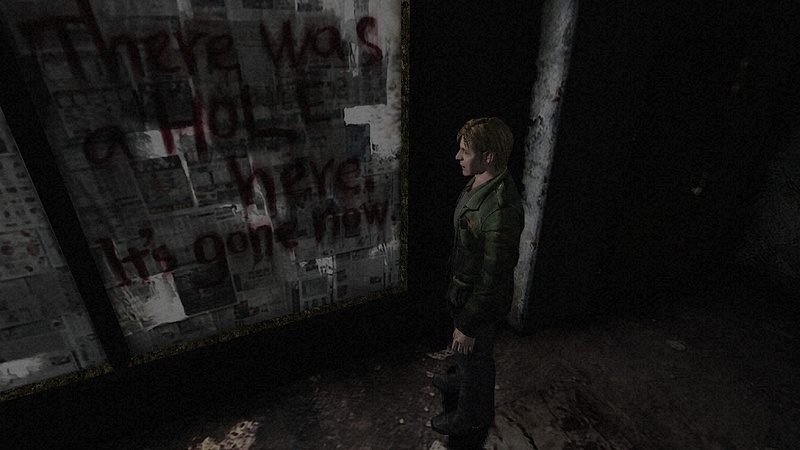 The Silent Hill HD Collection uses revamped textures and it shows. The first improvement noticed was the lighting. Just like Resident Evil: Code Veronica HD, the Silent Hill HD Collection has a new lighting engine. Heather’s flashlight illuminates in the shape of a circle rather than a rough angular shape. It’s also much smoother. The enhanced lighting allowed me to see things that I had missed during my playthrough of the original. For example, when walking on the amusement park tracks early in the game—and near the end, I never noticed how much was below them. I could see the roof of several little structures; perhaps they were cotton candy stands. I also never noticed the warped walls outside of the fenced areas in the amusement park. Warped signs and a flesh-toned surface was missed by me in my playthrough of Silent Hill 3 on PS2 and PC. In my preview of Silent Hill 3, the grain filter was off. 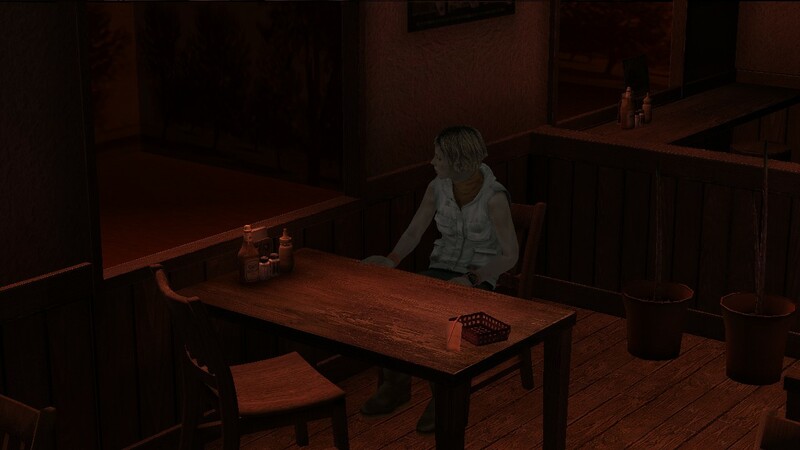 In both Silent Hill 2 and Silent Hill 3 HD, the filter has been remade. Whether there will be an option to turn them off was not confirmed at the time. The filter might be recreated, but it looks similar enough to the originals that I doubt anyone could possibly complain. The lack of a filter in my preview actually enabled me to appreciate the work done to the game’s dated textures. Looking at Heather, the ground, surfaces, and objects was a visual treat that as a fan of the series, really made me excited. The character models remain the same–which stand up today–but the textures have been either replaced with their original source or recreated. 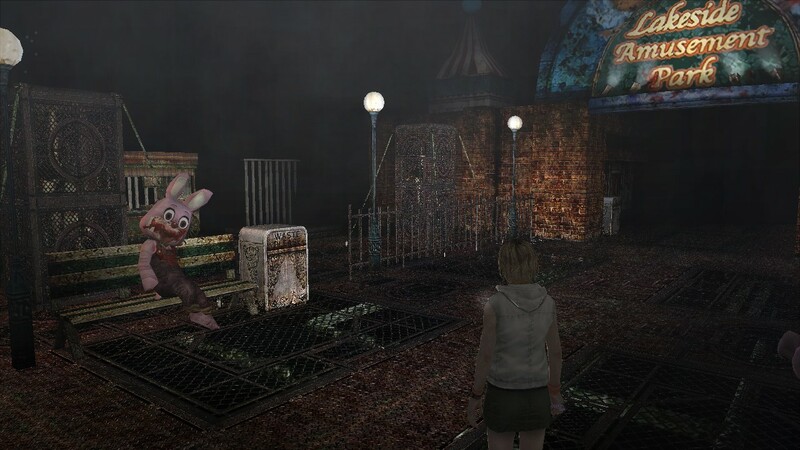 Silent Hill 3’s graphics have stood up well to modern standards, especially if played on PC, but the inclusion of these tweaked textures really did wonders. As a Silent Hill fan, I love looking for details in the environment. Documents, notes, scribbles, paintings and objects in the distance are all threatened by my curiosity. Looking at papers and pictures in the environment was one of the most fun things about previewing the Collection. Call me crazy, but that’s what a lot of Silent Hill freaks do. Due to the new team’s use of the original textures by the original developers, new details can finally be seen. Sure, some interpretation might be removed due to this, but it will provide fans with more concrete details to create a ton of new theories regarding the series’ lore. Looking at Silent Hill 2 (Whitney and I would peek at each other’s playthroughs) we noticed that a painting later in the game revealed James. In the painting James could be seen dead on a table with a gun in his hands. In that very same room lay a body in the same pose. It had a different colored shirt than James and his painted counterpart, but a detail like this was easy to miss in the originals. It’s things like this that excite me most about this HD Collection: seeing things Team Silent created but were unable to clearly show due to technological limitations. Disturbing details that might have been overlooked, due to the game’s standard definition origins, have been given a new lease on life. Object and creatures in the otherworld have been treated with more detailed textures. Speaking to Tomm Hulett, he told us that Team Silent had to do many little tricks to conserve space in the games. For example, some textures had to be reused on monsters. He told us of Team Silent’s reuse of a simple door texture for an enemy. The texture had been reused but stretched out to give it another purpose in the game. In the HD Collection, the new team is not confined by such memory constrictions and were able to revisit the textures in both games. Looking at a few enemies, I immediately noticed that they looked nastier and better. 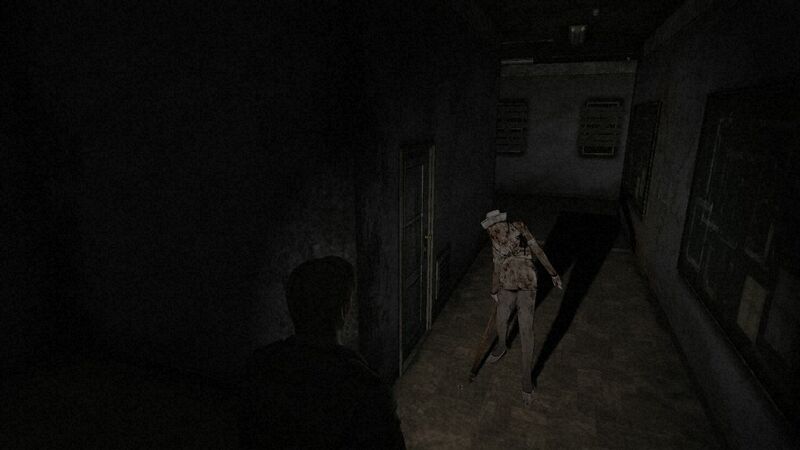 The Numb Bodies in Silent Hill 3 had a cleaner looking texture. I could see veins, stains, and other imperfections on the skin of these little guys. The Split Worm, and Leonard boss’ benefited from this re-skinning. I could see details that I had never noticed before in my previous playthroughs. The Split Work had a lot of veiny details, and Leonard’s monster form was very interesting to see redone. Nasty little details are a plenty, and I loved it. The water was remade for Leonard’s fight as well. Sure, that’s a small little detail, but it’s something that can be appreciated. I couldn’t get a good look at the details of either the Closer or the Double Heads (they’re viscous! ), but I don’t doubt that they’ve been given the same treatment. With Silent Hill 2, I noticed some really intense things due to the new textures. It’s common belief that the Abstract Daddy in Silent Hill 2 is a monstrous representation of Angela being sexually abused by her father. The creature looks like a man’s hunched over a frame. In the HD Collection, some new detail can be seen. Previously, it was hard to see both figured within the monster’s skin, but I could easily spot another separate mass beneath the larger one. Due to art and high res renders, this could be seen outside of the game, but it was now noticeable within the game. Perhaps due to the lighting and the textures, both masses within the monsters cancerous flesh was easier to spot. It certainly made me a little disturbed as I watched this creature move around the room. I’ve seen this many times before, but seeing the new detail of what might be a child within the monster felt new and immensely disturbing. It’s a wonder that these games got away with this stuff so long ago. Both Silent Hill games now have 5.1 surround sound. Unfortunately, the build of Silent Hill 3 that I played did not have the music added in yet outside of cutscenes. Whitney on the other hand had tracks in her build of Silent Hill 2. From what little I heard from her game, the songs seemed fine. I’m no audiophile, so differences in Akira’s original score and the remastered 5.1 version will have to wait until I have much more time with the games. Now, let’s move onto what everyone wants to know about: the new voices. Both Silent Hill games in the Collection include new voiceovers. The option to switch between the old and new ones have been confirmed for just Silent Hill 2. At the time of my visit, the new voiceovers were the only ones accessible. To ease concerns, I will tell you flat out that they’re good. Everyone can act well, and there are even some nearly identical performances. Starting with Silent Hill 3, I was a bit worried what sort of change would come to Heather’s recasting. I was not really worried about Douglas or Leonard. Claudia and Heather were the stars of this game. The actress who played Heather did a great job. No one should worry about the acting quality of any of these replacements. New Heather is noticeably different, and perhaps a little older sounding, but she gets the job done. Despite her performance being well up to par, I still prefer old Heather Morris, the original actress who played…Heather Morris (Silent Hill 3’s first release accidentally named Heather Mason as Heather Morris on the game’s box). Claudia’s new performance was chilling. She sounded almost identical to Donna Burke who played the original Claudia in Silent Hill 3 (as well as Angela in Silent Hill 2). In a fun nod to the original games, the actress who plays New-Claudia also plays New-Angela. Her range is actually quite surprising. Angela’s new voice lacks that “stutter” from the originals, and flows much better now. The actress also made Angela sound her age. Angela is a teenager—whether she looks it or not– and the new performance makes that apparent. Vincent sounds almost the same as Clifford Rippel’s original performance, but his pacing is less mysterious: less dramatic pause and inflection change. While the actors name was not given, you may recognize his voice from Atlus’s Catherine. I think it may have been the same guy who voiced Toby. Leonard’s performance was pretty short but I think it’s worth mentioning that he has a newfound accent similar to Claudia’s. It was never explained why a woman born and raised in a New England town had such a menacing British accent, but at least her father will now match! All in all, the new performances in Silent Hill 3 are good. The acting is not subpar. Whether they’re better than the originals is up to the player. The games’s script has not been changed if anyone has that worry. What I appreciate is the change of pacing for many of the characters. Especially in Silent Hill 2, this change makes dialogue sound more natural and less stunted. From what I listened to in Silent Hill 2, Troy Baker does a decent job as a new–but slightly gruffer–James Sunderland; Angela no longer sputters and she now sounds like a girl rather than an older woman; Eddie is still a bit too rough for my tastes: the new actor seemed to play on Eddie’s insanity when it came to the tone of his voice. Mary/Maria, played by Mary Elizabeth McGlynn adds a more seductive take on Maria, but her overall deeper voice than Monica Taylor Horgan takes some getting used to when the character Mary is talking. But her performance is good from what I had heard. I am really excited for the Silent Hill HD Collection. Sure, I already own these games and have played them numerous times, but playing them with graphical improvements, new surround sound audio, and on my current console without emulation problems is hugely appealing. The Silent Hill series is filled with many purist fans. I’m sure some of them will already dislike the idea of this collection because it’s been touched by hands not of those of the original creators, but I am really looking forward to it. I’m not one to feel like something I already own has been damaged by the existence of something new, so I will take what I’ve wanted from this collection, and disregard what I don’t like. Right now, there’s not much I don’t like. The voices will definitely take some time to get used to, but I think this collection has the ability to bring new fans into the Silent Hill series. Doing so by re-releasing two of the best games in the series is something that I certainly appreciate. I need more friends that I can talk about Silent Hill with! *The above screenshots were released some time ago. Konami allowed us to post our preview now, but have yet to provide new screenshots for the preview. The article will be updated with the new screens when they become available.